20 pcs. 0.18 CHF ea. from 60 pcs. 0.15 CHF ea. from 140 pcs. 0.13 CHF ea. from 360 pcs. 0.11 CHF ea. Ask for a rebate from 1'500 pcs. They don't come much smaller than this! Here comes the equivalent to our smallest cube. It's hard to believe, but this little disc magnet with a diameter of 1 mm and a height of 1 mm is strong enough to pin a little note to the wall. Of course, there should not be a breeze coming through... 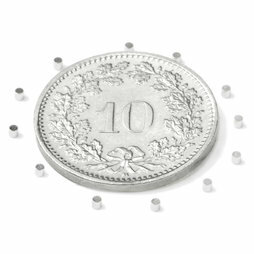 Universities or research labs sometimes request such small magnets, for instance to secure tiny parts under the microscope. 20 pcs. 0.19 CHF ea. 20 pcs. 0.22 CHF ea. 20 pcs. 0.21 CHF ea. 20 pcs. 0.20 CHF ea. 20 pcs. 0.35 CHF ea.